For other people named John Mackie, see John Mackie (disambiguation). 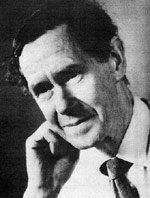 John Leslie Mackie (/ˈmæki/; 25 August 1917 – 12 December 1981), usually cited as J. L. Mackie, was an Australian philosopher, originally from Sydney. He made significant contributions to the philosophy of religion, metaphysics, and the philosophy of language, and is perhaps best known for his views on meta-ethics, especially his defence of moral scepticism. He authored six books. His most widely known, Ethics: Inventing Right and Wrong (1977), opens by boldly stating that "There are no objective values." It goes on to argue that because of this ethics must be invented, rather than discovered. Mackie was born 25 August 1917 in Sydney. His mother, Annie Burnett Duncan, was a schoolteacher, and his father, Alexander Mackie, was professor of education at the University of Sydney as well as the principal of the Sydney Teachers College, and was influential in the educational system of New South Wales. He graduated from the University of Sydney in 1938 after studying under John Anderson, sharing the medal in philosophy with eminent jurist Harold Glass. Mackie received the Wentworth Travelling Fellowship to study Greats at Oriel College, Oxford, where he graduated with a first in 1940. During World War II he served with the Royal Electrical and Mechanical Engineers in the Middle East and Italy. He was professor of philosophy at the University of Otago in New Zealand from 1955 to 1959 and succeeded Anderson as the Challis Professor of Philosophy at the University of Sydney from 1959 to 1963. In 1963, he moved to the United Kingdom, becoming the inaugural holder of the chair of philosophy in the University of York, a position he held until 1967 when he was instead elected a fellow of University College, Oxford, where he served as praelector. In 1974, he became a fellow of the British Academy. I am nowhere mainly concerned to refute any individual writer. I believe that all those to whom I have referred, even those with whom I disagree most strongly, have contributed significantly to our understanding of ethics: where I have quoted their actual words, it is because they have presented views or arguments more clearly or more forcefully than I could put them myself. Mackie married Joan Meredith in 1947. One of Mackie's three daughters, Penelope Mackie, also became a philosopher. She lectured in Philosophy at the University of Birmingham from 1994 to 2004, and was appointed Head of the Department of Philosophy at the University of Nottingham in 2007. Mackie's younger son, David, is also a philosopher and graduated from Oxford University where he held lectureships at Exeter College, Corpus Christi College and Christ Church before being appointed a Fellow and Tutor at Oriel College. As of 2013 he teaches at D'Overbroeck's College, Oxford. Mackie was best known for his contributions to the fields of meta-ethics, philosophy of religion, and metaphysics. In meta-ethics, he took a position called moral scepticism, arguing against the objective existence of right and wrong as intrinsically normative entities on fundamental grounds as unsure about what kinds of things such entities would be, if they existed. His perhaps most widely known work, Ethics: Inventing Right and Wrong, bluntly begins with the opening sentence "There are no objective values". He uses several arguments to support this claim that objective values are false. He argues that some aspects of moral thought are relative, and that objective morals require an absurd intrinsic action-guiding feature. Most of all, he thinks it is very unclear how objective values could supervene on features of the natural world (see the Argument from queerness). Fourth, he thinks it would be difficult to justify our knowledge of "value entities" or account for any links or consequences they would have. And, finally, he thinks it is possible to show that even without any objective values, people would still have reason to firmly believe in them (hence, he claims that it is possible for people to be mistaken or fooled into believing that objective values exist). The Times called the book "a lucid discussion of moral theory which, although aimed at the general reader, has attracted a good deal of professional attention." Mackie was a supporter of the compatibilistic interpretation of free will. Concerning religion, he was well known for vigorously defending atheism, and also arguing that the problem of evil made untenable the main monotheistic religions. His criticisms of the free will defence are particularly significant. He argued that the idea of human free will is no defense for those who wish to believe in an omnicompetent being in the face of evil and suffering, as such a being could have given us both free will and moral perfection, thus resulting in us choosing the good in every situation. In 1955 he published one of his most reprinted articles, "Evil and Omnipotence", summarizing his view that the simultaneous existence of evil and an all-powerful, all-knowing and all-good God was "positively irrational". Mackie's views on this so-called logical problem of evil prompted Alvin Plantinga to respond with his version of the Free Will Defense to which Mackie later responded in his The Miracle of Theism. Upon being given a copy of Richard Dawkins' The Selfish Gene as a Christmas present, he in 1978 wrote an article in the journal Philosophy praising the book and discussing how its ideas might be applied to moral philosophy. Philosopher Mary Midgley responded in 1979 with "Gene-Juggling", an article arguing that The Selfish Gene was about psychological egoism, rather than evolution. This started a dispute between Mackie, Midgley, and Dawkins that was still ongoing at the time of Mackie's death. Truth, Probability, and Paradox (1973), Oxford University Press, ISBN 0-19-824402-9. The Cement of the Universe: A Study of Causation (1980), Oxford University Press, ISBN 0-19-824642-0. Problems from Locke (1976), Oxford University Press, ISBN 0-19-824555-6. Ethics: Inventing Right and Wrong (1977), Viking Press, ISBN 0-14-013558-8. Hume's Moral Theory (1980), Routledge Keegan & Paul, ISBN 0-7100-0525-3. The Miracle of Theism: Arguments for and against the Existence of God (1982), Oxford University Press, ISBN 0-19-824682-X. Logic and Knowledge: Selected Papers, Volume I (1985), Oxford University Press, ISBN 0-19-824679-X. Persons and Values: Selected Papers, Volume II (1985), Oxford University Press, ISBN 0-19-824678-1. ↑ See, for example, Mackie 1977: Argument from Queerness. The Argument from Queerness also suggests that the only way to know of such entities would be through an intuition or another faculty different from how we know everything else. He conjoined moral scepticism with error theory, holding that moral judgments, while cognitive, are all false since there are no moral properties about which our moral judgments could be correct. ↑ See, for example, Mackie 1982. ↑ Mackie, J. L. (April 1955). "Evil and Omnipotence". Mind. 64 (254): 200–212. doi:10.1093/mind/LXIV.254.200. JSTOR 2251467. ↑ Mackie, J. L. (October 1978). "The Law of the Jungle". Philosophy. 53 (206): 455–464. doi:10.1017/S0031819100026322. JSTOR 3749875. ↑ Midgley, Mary (October 1979). "Gene-Juggling". Philosophy. 54 (210): 439–458. doi:10.1017/S0031819100063488. JSTOR 3751039. Franklin, James. (2003) Corrupting the Youth: A History of Philosophy in Australia, Macleay Press, ISBN 1-876492-08-2. Honderich, Ted (ed). (1985) Morality and Objectivity: A Tribute to J. L. Mackie, Routledge Kegan & Paul, ISBN 0-7100-9991-6. Stegmüller, Wolfgang. (1989) Hauptströmungen der Gegenwartsphilosophie (Vol. IV, Ch. II, Part A.: Moralphilosophie ohne Metaphysik; Part B.: Mackies Wunder des Theismus), Alfred Kröner Verlag, ISBN 3-520-41501-1.